Matcha vs Green Tea – the terms and flavors of these two teas have infiltrated all sorts of food products over and above the teacup. It can be a commonly held perception these two teas are one in the same. Put simply, they are not. While both matcha and green tea come from the same Camellia Sinesis species of plant, their differences couldn’t be greater in so many ways. So if you’ve been drinking any old green tea thinking it is matcha and assuming you are reaping the copious health benefits associated with it, please read on! One of the most obvious differences between matcha vs green tea is the clarity of the drink itself. If you are able to look through your green tea to the bottom of the cup, you’re not drinking matcha. Regular green tea can vary in green hue depending on the specific type of tea used, but generally will be a pale greenish golden color and clear enough to see through. 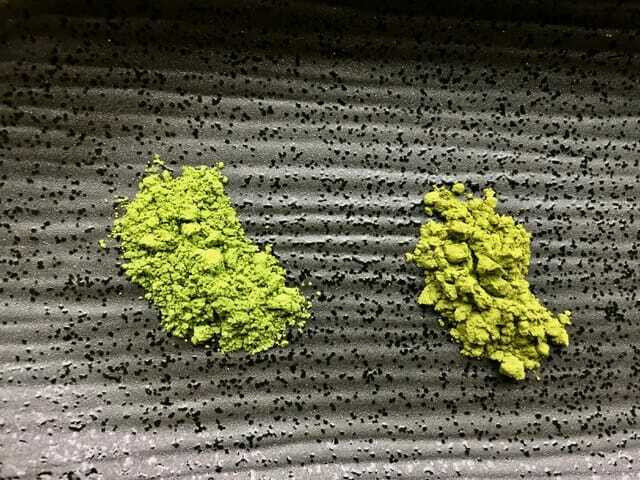 Pure matcha powder is a deep brilliant green that comes from late harvest shading of the plants enhancing chlorophyll production and nutrition producing a non-translucent cup of tea. Green tea is not shaded, and quite often can have varying methods of drying and processing including pan-frying, particularly in tea coming from China. As one would imagine, this process does nothing to protect the nutritional values, but instead is destructive in retaining nutrition. Pure matcha is a fine powder made from slow grinding of young tender dried leaves. In Japan, the matcha harvest process is a result of meticulous time honored traditional methods producing the world’s finest and most nutritious matcha. Which brings us to possibly the most important difference between green tea and matcha – the nutrition facts. When consuming pure matcha, you are drinking in all the superior nutrition present in the young leaves prior to harvest. Green tea preparation consists of steeping loose leaves in boiling water so the nutrition left in the water is as a result nowhere close to what is present in matcha. Whichever tea you choose, just be sure it is organic as whatever touched those tea leaves ends up in your cup, and in the case of matcha, in a much more concentrated amount. Outlined below is a sampling of some of the nutritional components in matcha vs green tea. A quick glance shows the vast disparity in nutritional values. This information derived from the Standard Table of Food Composition in Japan, using measurements of 100 grams for both teas. Please refer to the table* for more additional detailed information. Last but not least is the taste difference between matcha vs green tea. Matcha possesses a rich, earthy flavor full of umami that can vary slightly depending on soil composition. The mouth feel of matcha is distinctly different than any other tea and imparts a rich but clean taste. Green tea tends to be a lighter more herbal taste. Most green teas consumed today come from the Sencha variety of Camellia Sinesis bush. In review, the contrast between matcha vs green tea tea is really quite vast in so many ways. Taste, color, texture and of course the big one – nutrition. Green tea certainly holds a place of high esteem culturally and brings about a certain refreshing and rejuvenating appeal but if nutrition is your focus, matcha obviously packs far more benefits cup for cup. So why not optimize your efforts. Find the best pure organic matcha from Japan here.